Two pieces of action for this volume, first Ponygon and Sunbeam are up against another horse-like mamodo which is pretty intense. Then Dr. Riddles arrives with no answers but more speculation on what the mystery building might be. A tiny hint is dropped here which nobody picks up on but it did set my mind rolling and I've got an idea, so we shall see! 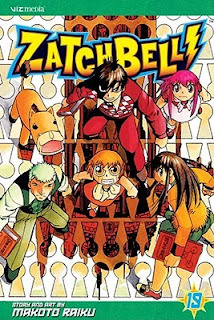 Finally the last half of the book is a sweet story of Zatch receiving a letter from a dear old friend (whom he, of course, does not remember) who has decided he wants his book burned; it being the best course of action for the sake of his owner. This turns out to be such a lovely story of empowerment and a great battle at the same time. So glad I'm back to reading this series! Just loving this volume. A couple new mamodos on both sides. Lots of battles. Our guys have arrived at the structure where the showdown is going to take place with the current baddie wanting to take down both the human and mamodo world. On the emotional side, Kiyo has no idea he keeps breaking Suzy's heart and she even tried to show him, so sweet. The ending makes us wonder if a major character is going to die! 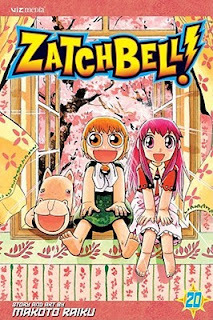 Great manga!